In case you missed it, here's Part 1. Now it's ready for fabric. I chose Covington Bosporus in Flax. Before I could deal with the tufting, I needed new buttons. I found the buttons online, but learned that you needed a machine that cost about $150 to cover them in fabric. That's when I decided I would just hot glue my new fabric right over the existing buttons. They don't look perfect up close, but you can't even tell once they are tucked away in the chair. Now, I was ready to upholster the back of the chair. 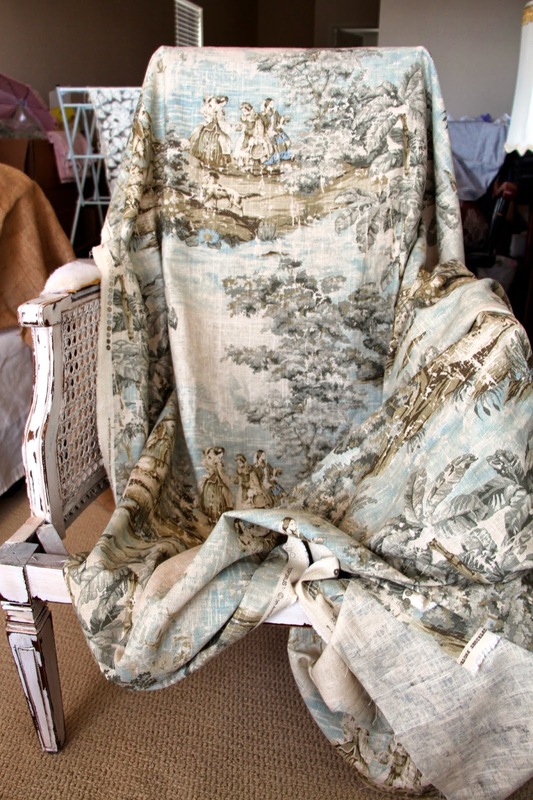 Without cutting the fabric, I draped it over the back of the chair. I left about 8" of extra fabric on the left side, and let the rest of the yardage just drape over the other side until I was ready to cut. You could cut it at this point, leaving extra fabric on each side to allow for the tufting, but having never done this before, I was more comfortable leaving it uncut until I got the tufting just right. 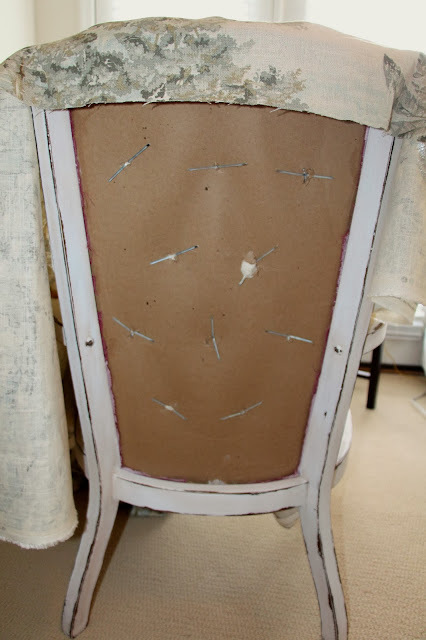 Starting with the top row of buttons, I started pushing them through the fabric and securing them in the back of the chair. This was pretty easy since I had the existing holes in the cardboard to use as a guide. 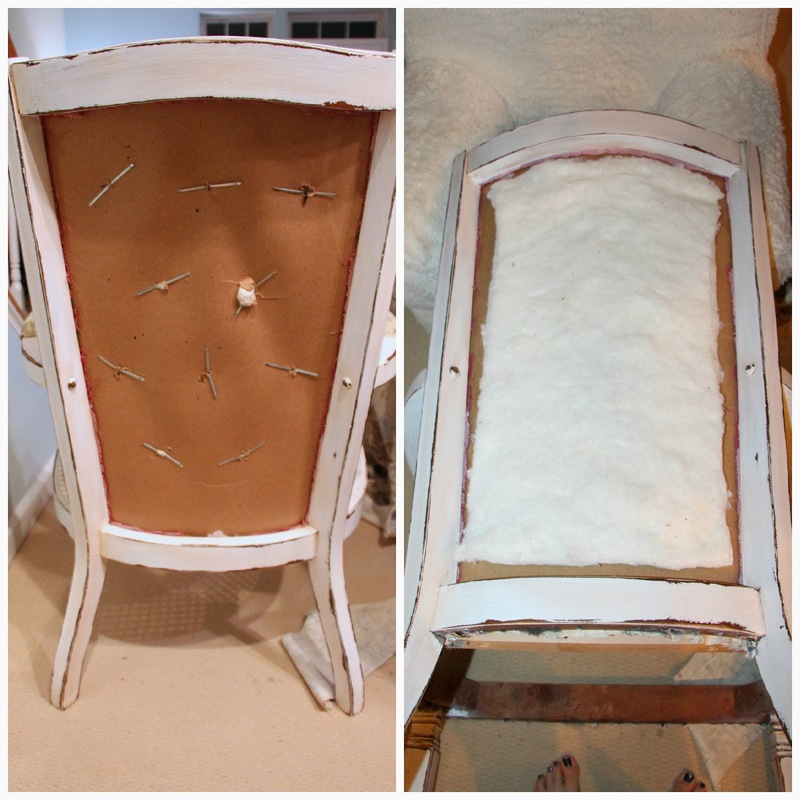 I used the "before" pictures I took of the chair to see where the pleats were. Most of the pleating sort of happens on it's own; you just need to arrange the fabric so it's nice and neat and tucked "under", like in the pictures below. This is easier than it looks, I promise! 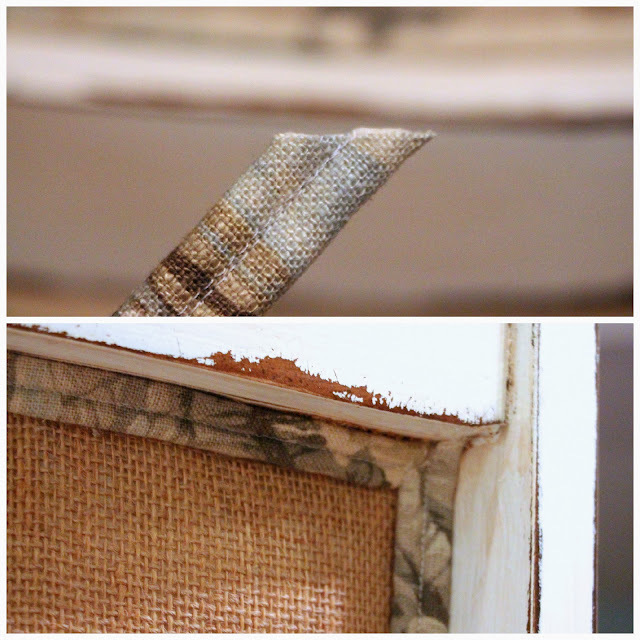 Then, I stapled the fabric to the edge of the frame. I pulled the fabric so it was snug, but not so tight that the pattern was stretched. Once I had stapled all the way around, I cut the excess fabric, just leaving about 1/4" above the staples so that it wouldn't pull away. Then, I moved onto the arm pads. I just cut small pieces of the fabric and pulled it snug, stapled it on, and cut away the excess. 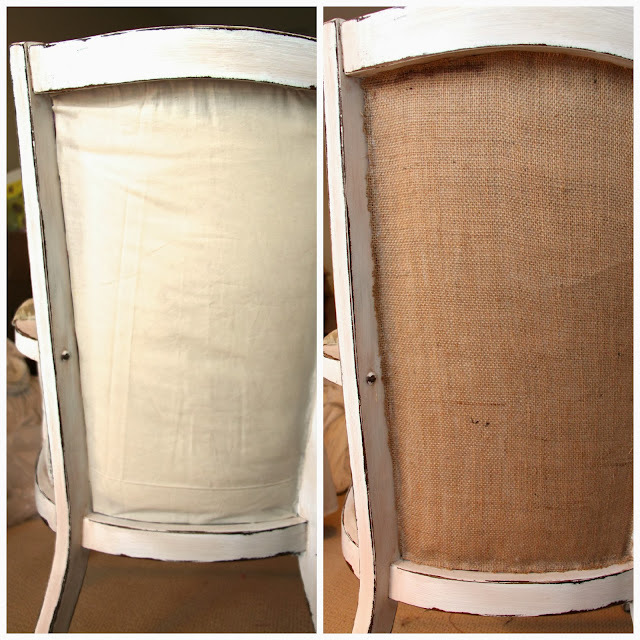 For the back of the chair, I wanted to use burlap to add something a little unexpected, and just because I love it! There was a thin layer of batting that was there when I took the original fabric off of the back. It was in good shape, so I reused it. I laid it down over the cardboard and secured it by gluing a piece of muslin fabric over it. Then, I hot glued the burlap to the edges of the muslin. 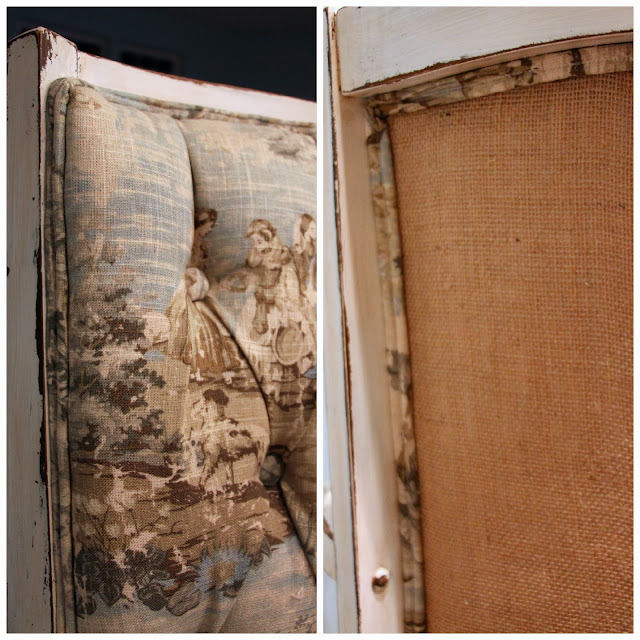 The messy and unfinished edges of burlap didn't matter because I was going to trim the back in piping. Next, I cut the fabric for my seat cushion. For the top piece, I found it easier to just drape fabric over the cushion and cut around it, rather than trying to use the old fabric as a template. I only needed an extra couple inches of fabric around the edges to attach my piping, but I left way more...just because I was worried I'd be short. Also, if your fabric has a pattern, be mindful of which way the cushion will be facing when it's in the chair, and cut your fabric accordingly. For the sides of my cushion, I measured around the existing cushion to get the length of fabric I would need to cut. I didn't have one strip of fabric long enough to go all the way around, so I had to cut 2 and sew them together. As for the width that I needed, I measured the cushion, then added about 1 1/2" on top which would be attached to the piping, and about 4" on the bottom, which would be stapled underneath the cushion. Does that make sense? Basically, my cushion is 4" wide, and the strip of fabric that I cut to cover it was 9 1/2" wide. Now that all the fabric for my cushion was cut, I needed to make the piping so I could sew it all together. I considered buying pre-made piping or decorative trim, but I really wanted the piping to match the fabric, so I made it myself. I've sewn with piping before, but I've never made it. It was surprisingly easy! I'm going to refer you over to Little Green Notebook's tutorial because that's the one I used, and she does a great job explaining the process with plenty of photos. The only thing about her tutorial that I didn't follow was cutting my fabric along the bias. 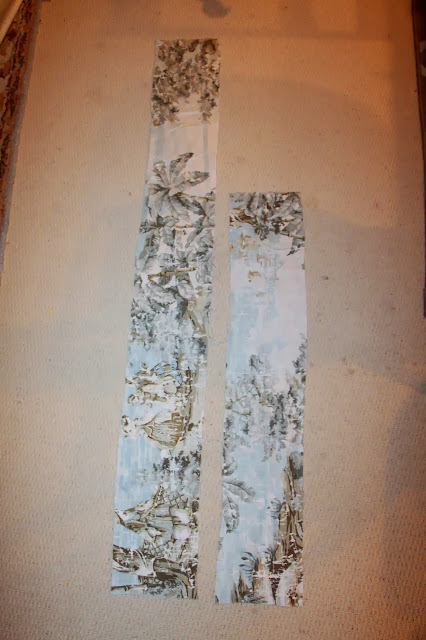 I just cut the longest lengths of fabric that I had left, and that worked out just fine. Here's what I used to make my piping. I used about a bag and a half of this cord for the entire chair. I used double piping around the frame of the chair because it was necessary to cover my fabric and staples. I used single piping for the cushion. 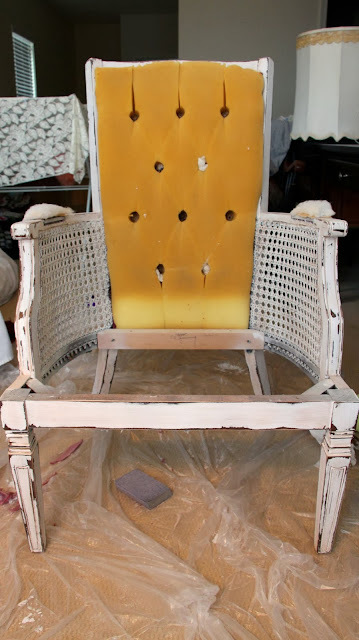 I just measured each area where I needed piping on the chair, and made my piping in those exact lengths, leaving a little extra for joining it together at the end. Mkay. Are you still with me? Now, I'll walk you through how I made the seat cushion since the piping is ready to go. I draped the fabric over the cushion, right side up, just like it will be when it's finished. I started pinning the piping along the edge, facing the raw edge of the piping down, and making sure the top of the piping was flush with the top of the cushion. I pinned very close to the piping, but not through it. I positioned the ends of my piping so they would be hidden at the back of the cushion when it was finished. For sharp corners, I snipped just to the edge of the piping and continued bending it around the corner. Once the piping was pinned all the way around, I joined the two ends together. 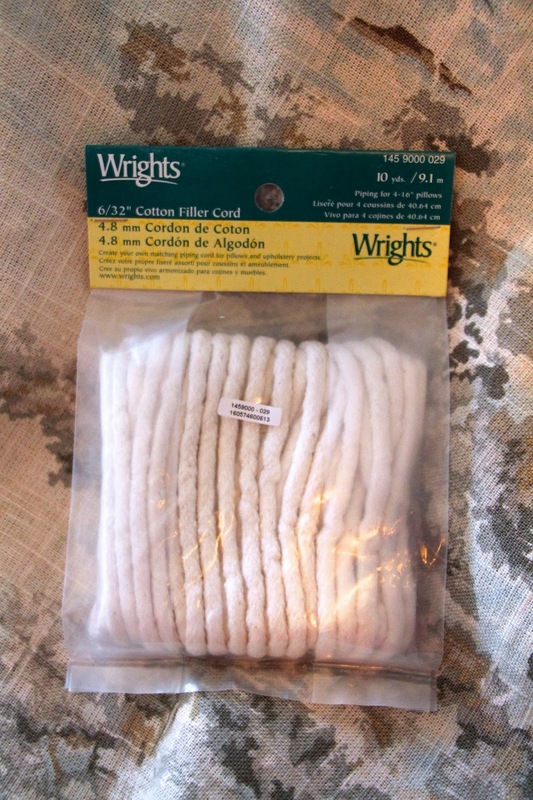 Pull the fabric back and cut the exposed cord flush with the other end of the cord. Fold the fabric over to hide the raw edge. Wrap it around the other end of the piping and pin in place. Now when you sew the piping on, it will be one continuous piece with just the small seam. Now my piping was ready to be sewn on. The cord should be on the left side of the needle. A zipper foot helps when sewing piping, but I didn't use one, and it turned out just fine. Just be sure to sew right next to the edge of the piping, but not on top of it. 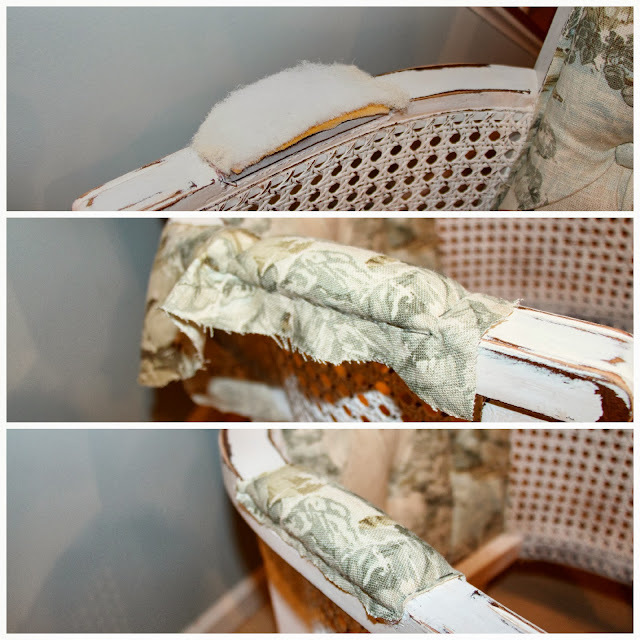 I think sewing around the corners of this cushion was the hardest part of the entire project. I just worked slowly and carefully. 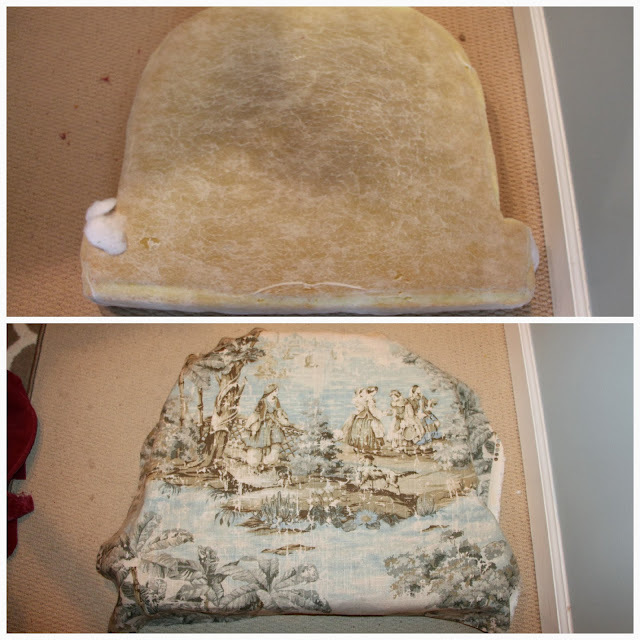 Once all the piping was sewn, I put the cover back on the cushion to test my work. 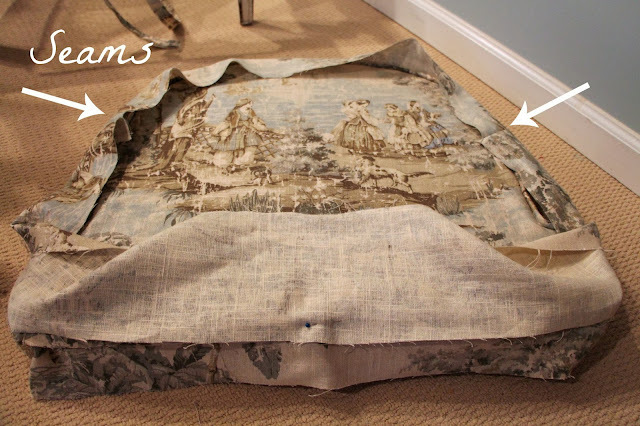 (The extra fabric hanging over the sides of the cushion is extra and will be cut away). I left this piece on the cushion to pin the sides next. Remember earlier, I cut 2 strips of fabric to get the length I needed to go around the cushion? I sewed them together to get one continuous strip of fabric, then turned it inside out and brought it to the cushion and began pinning. I laid the side piece on top of the cushion as I pinned very close to the edge of the piping. See where the piping is in the picture below? To check that I was pinning it correctly, I just pulled the fabric down. Once I had it pinned all the way around, I was ready to sew it on. You should be sewing with the main top piece of fabric right side up, and the side panel will be wrong side up. Your sewing needle should be to the right of the piping. The piping is in between my fingers in the picture below. You'll be working with a lot of fabric at this point, so sew carefully and make sure not to get any fabric caught in the machine! Here it is all sewn together. Once I knew I had it sewn correctly, I turned it inside out and trimmed the excess fabric. After that, I just flipped the cushion over and stapled the sides of the fabric to the back. Here's how I did the corners. Now the bottom of the seat cushion still needs piping, but the great news is that was just stapled on the original piece, so I did the same here. 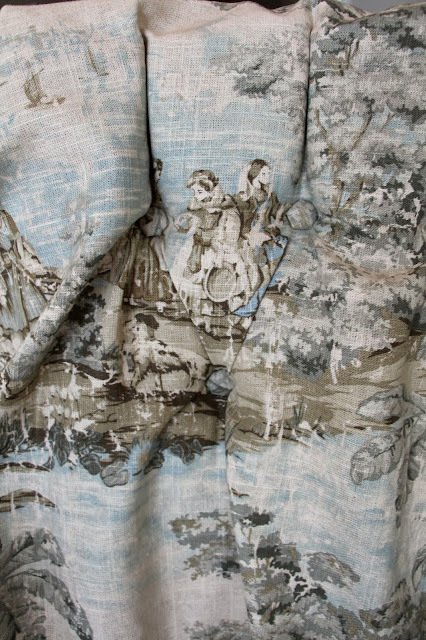 I lined up the piping along the edge of the cushion and stapled away. 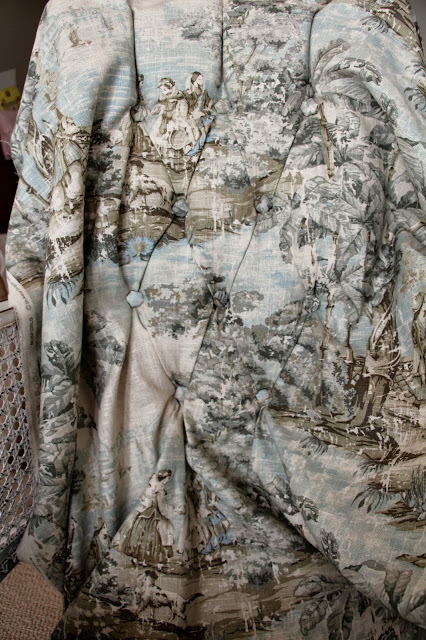 I snipped into the fabric (not the piping itself) to bend it around corners like I mentioned earlier. The finishing touch was to add my piping to the rest of the chair. I just hot-glued it on. I cut the piping at an angle to make the ends meet up nicely, and tried to join them in an inconspicuous place. Once I screwed the seat cushion back in place (with Josh's help! 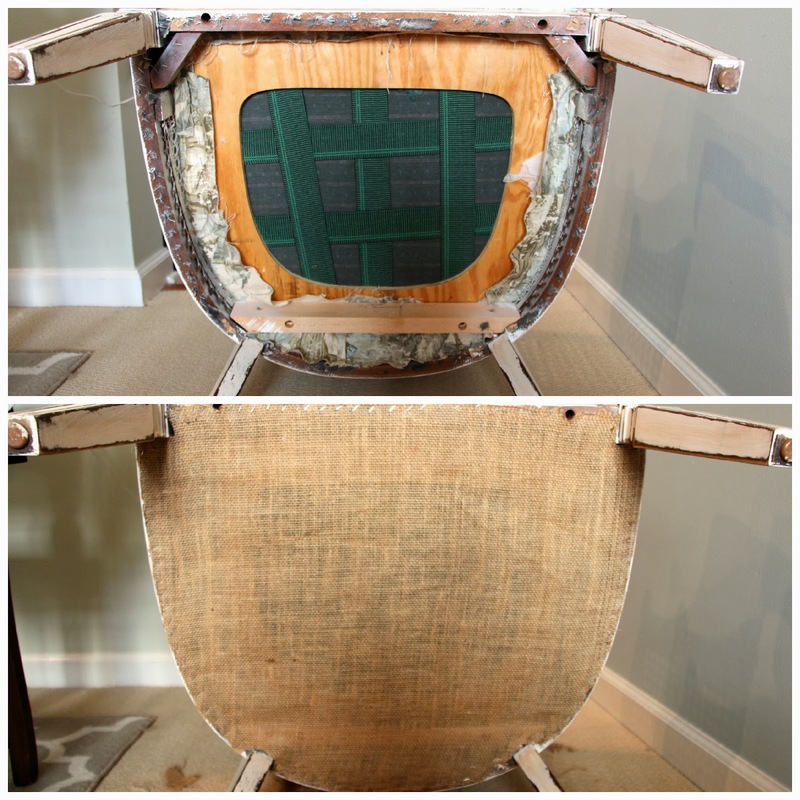 ), I finished the under side of the chair in burlap. Not that anyone will see it, but it was just what I had on hand. I just cut it to size, and stapled it in place. 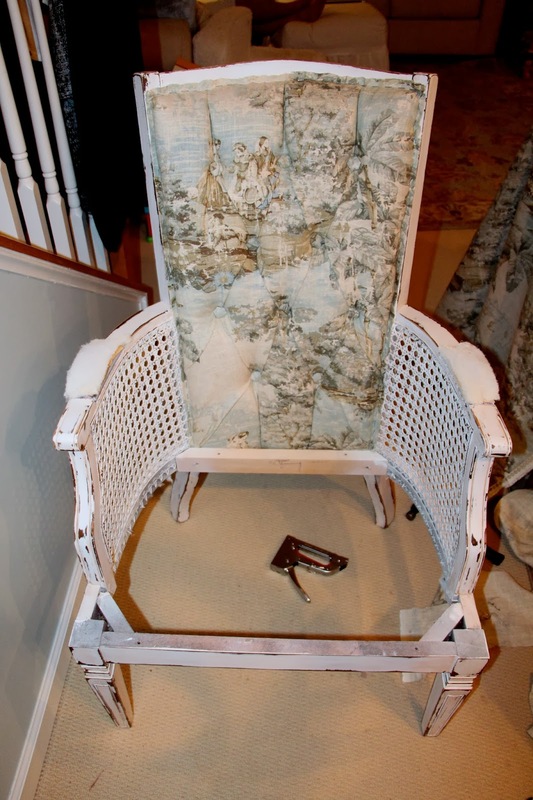 For your reference, I purchased 3 yards of the toile fabric for this chair. I used the upholstery chart provided by Online Fabric Store to estimate how much I would need, and 3 yards seemed to be the right amount. I had some leftover, but I think any less would have been cutting it too close. Did you make it this far?! I hope you did! I hope this step-by-step of what I did will be really useful to you if you ever decide to take on a similar project! Please let me know if you have questions or need a further explanation of any of the steps....and like I said before, I definitely welcome any tips or advice, as well! This is just my first, but certainly not my last, upholstery project! I'm going to do the full "before and after" and reveal shots tomorrow! Sorry to make you wait again, but I promise it will be worth it! Aw thanks so much, Jenn! I promise though, you could definitely do this too!!! Thanks Katie! I haven't done a club style chair yet, sorry! Thanks....super excited to move in!